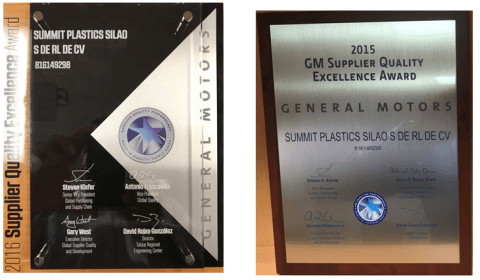 Summit’s Mexico Plant Receives GM Supplier Quality Excellence Award for 2016 - Summit Polymers, Inc. Summit Polymers is pleased to announce that its SPN1 Silao, Mexico plant received GM’s Supplier Quality Excellence Award for the 2016 calendar year. This award is given to specific manufacturing locations and only top performing manufacturing sites are eligible to receive it. Suppliers who receive this award have met or exceeded a very stringent set of quality performance criteria and have achieved the cross-functional support of the entire GM organization. This was even a larger challenge as GM continues to launch many new and exciting products. The Silao plant also received the 2015 Supplier Quality Excellence Award.